With two weeks left on our Nepali visa we considered our options. 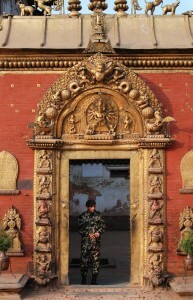 We had to return Kathmandu to get our Indian visas but what would we due while we waited for them? Appropriate documents in hand and applications carefully filled out we walked to the Indian embassy early in the morning. At one o’clock my number was called. The man checked my application and waved me to the next window. While I paid my fee I watched Val’s papers quickly reemerge, she had neglected to list her middle name. I was told to come back in ten days. Val enjoyed repeating the process the next day. Ten days is enough for a short trek, but we felt we’d walked enough. We used the time catch up on the blog, write friends, and sleep in – for once we’d earned the right to be lazy. Our days began with tandoori chicken and ended with rare steak. For a while it was heaven but Thamel’s allure fades quickly. We fled to Bhaktapur, a charming village of ancient temples and traffic-free cobblestone streets. It was a fantastic, and much needed, break from Kathmandu’s frenetic pace. Our next visit to Nepal will include a more time here.